The entrance to our museum is located at the far side of the Gift Shop, see our signs in this regard. The museum contains interesting artifacts, all of which are Chinese, but not all of which are Buddhist. There are beautiful examples of traditional blue and white Chinese porcelain, as you enter the museum. In the glass case running the length of the wall are numerous wooden carved and painted statues of the Bodhisattva, Kuan-Yin. In the glass cases that run down the middle section of the museum are different displays, showing for example Chinese tea-sets, used in formal tea-drinking ceremonies, various Chinese musical instruments, writing brushes used for Chinese calligraphy and other displays of Buddha statues etc. 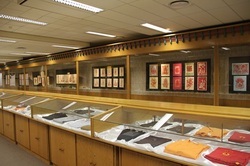 There are also exhibitions of religious implements used in Tibetan Buddhist practice, examples of Monastic clothing, Buddhist Sutras and other Buddhist artifacts. The exhibition ends with the “King’s Bowl” reputed to have been used by kings from long ago, who needed to refresh themselves after a long days journey on horseback. They knew how to rub the handles of this specially carved bronze bowl to make the water spray upwards to cleanse their face, without having to bow down to the bowl as a commoner would. Come and see if you can make the water spray up to you and show that you were a king in a past life! The museum is open daily from 09h00 to 17h00.Entrance is free.